Who goes into a classroom, sometimes at a moment’s notice, and takes over for us? Often substitute teachers are asked to go into classrooms to allow teachers to take advantage of professional development provided by the Southern Oregon ESD. This fall, training designed specifically for substitutes, with a focus on strategies and resources, was added to the SOESD's offerings! The half-day workshops offered in three different counties included classroom management techniques and lessons to promote literacy in all subject areas through reading and writing strategies. Training was designed expressly for people willing to venture into the unknown with little advance warning. The participants were given school calendars and informed of school policies specific to school districts, as well as lesson plans, activities, a bibliography of books, and research-based practices pertinent to kindergarten through Grade 12. 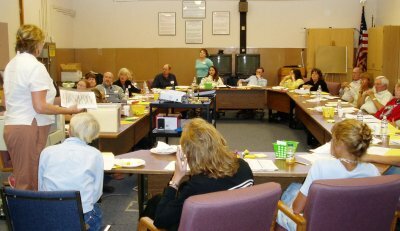 The idea to host a training session designed for substitute teachers emerged out of the SOESD Mentoring Project. During one of their sessions, the mentors and new teachers spent time preparing for a substitute teacher. While doing this, mentor project participants realized that substitutes would benefit from training as well. Substitute teachers involved in the training were encouraged to develop a sub kit that can be grabbed quickly and brought on the road to any classroom. Kits could include get-acquainted activities, campus maps, themed lesson plans, behavior management techniques, and content area activities. Attendees practiced many of the activities throughout the training, enhancing their ability to venture into classrooms with confidence. Their confidence and teaching skills will contribute to the success of all of our students. Substitute training will be scheduled again in Fall 2008. For more information, contact SOESD Literacy Specialist Rea Snyder at (541) 776-6771.